I really don’t like dance music, at least not from a “listening” standpoint. Whereas I appreciate the need for a beat, the perpetual oontz oontz influencing body movement and coaxing hot liquid from the skin of the young and single club patrons lucky enough to be allowed past the velvet rope, it's a genre specific to the confines of whatever all-night domicile features DJ So-and-So’s handiwork. Yes, it’s a skill to keep a club rockin,’ but… without the club, the patrons and the alcohol, dance music doesn’t translate well in a “listening” sense. One thing you can say about Damian Lazarus, London DJ-turned-Los Angeles maestro, is that he’s evidently attempting to branch out. His album, Smoke The Monster Out, is what one could call a semi-industrial electro beat art statement, reveling in its allegiance to Brian Eno and firmly tied to a raver-friendly foundation. As a budding musician, Lazarus is ambitious, cutting his compositional teeth (with the help of Arthur Jeffes) on ominous and tonal film score interludes (“Cold Lizards”); pop tracks (“Neverending”) and trip hop atmospherics (“Spinnin’”). He covers Scott Walker (“It’s Raining Today”) and dabbles with Lou Reed (a “Walk On The Wild Side” riff finishing up “After Rave Delight”). There’s a lot that Lazarus wishes to do, which is why Smoke The Monster Out only kind of connects. 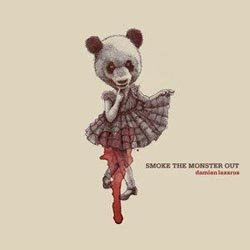 As the darkly ominous swell of the album’s title track sort of seeps into being, Smoke The Monster Out utilizes those familiar dance beats, minimalist on the percussion end while the backdrop howls and hums. Piano notes follow with “Moments,” a sort of dance lullaby featuring Swedish singers, Taxi Taxi (Johanna and Miriam Berhan), both of whom appear throughout the album and contribute to some of its best moments. Like Tricky, Lazarus’s music seems to benefit from feminine and angelic melody as “It’s Raining Today,” “Spinnin,’” and the Sneaker Pimp-ish “Come And Play” represent its highlights. When Lazarus himself vocalizes, it’s less emotional, the only exception being his KMFDM snarl in the Kraftwerk-ian “Memory Box.” A brooding android of a song, “Memory Box” is the album’s spoken darkness, its other sinister moments cut out of the Angelo Badalamenti (“Cold Lizards”) or John Carpenter (“Lullabies”) handbook of film scores and tones that convey dread. Otherwise Lazarus plays popster, satirically (maybe?) with the mechanized folk and purposely trite “Diamond In The Dark,” (the soft rock beat under Lazarus’s humorously impassioned “I can see the light/that’s shining on you” while the static of applause politely emerges… hilarious) and the straightforward dance number, “Neverending,” which adds another example to my ever-lengthening list of reasons why Auto-Tune need be destroyed. And though Lazarus does succeed at furthering himself and his craft from the dance floor, he sort of shoots himself in the foot by forgetting that he is, above all else, a DJ. As eclectic as the music is on Smoke The Monster Out, Lazarus allows this diversity to drive his vision, leaving it to feel at times disjointed or unfinished. As a DJ, his main concern is keeping the beat going, blending music to fit seamlessly into an ever-changing but long-lasting block of songs that never loses its ground. Smoke The Monster Out would’ve benefited from such treatment, just an extra step to refine and unify his product. The big band trumpets ringing beat-worthy for “Bloop Bleep” exemplify this refinement: a perfect marriage of compositional artistry and creative DJing. Had something like “Bloop Bleep” not been included, I may have felt differently about Lazarus’s debut, better satisfied with his efforts. But, the track introduces too late in the album a fun and thoughtfully considered side of Lazarus that doesn’t receive its due exposure. Smoke The Monster Out, while accomplished, says more about the influences than the artist himself.